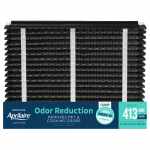 After years of research, Aprilaire has introduced their new, "Odor Reduction" MERV 13 media air filter. The highly specialized media used to manufacture this filter contains activated carbon AND is 75% effective at removing airborne impurities less than 0.3 microns in size. Reduces odors and pollutants like pet odors, cooking odors, VOCs, particulates and more!